Christoph got in touch with me before the con and asked if I was interested in checking out Free Spacer. I’m generally fond of playtesting new games and anything Sci-Fi perks my interest because I’ve found so few that I enjoy. The genre almost always requires ridiculous amounts of knowledge about the setting before you can really appreciate it. I love Star Trek, in part because I’ve watched hundreds of episodes. Free Spacer endeavors to be hard sci-fi at it’s core, with room for the fantastic around it’s periphery. Really more Farscape or Firefly than Star Trek, but it could probably tackle most of the genre. The setting is vast. It is filled with eight dominant species, and many others on the periphery. There are multitudinous faction, enterprises, and interests. The technological advances like FTL travel and software imprinted matter feel both familiar (we’ve seen this before in other mediums) and distinct (they have a particular place in the world and have been created for a reason, or as a result of something in the setting’s history). The action of the game felt like a slightly less seedy version of Shadowrun. You play independent operators, which might mean mercenaries or it might mean freelancers, depending on the group. You go on jobs, which are defined through a fairly in-depth negotiation mechanic, gain resources, build up your gear and ship, and presumably repeat. I don’t recall if the system has a faction status mechanic, but even if not it’s clear that you’ll be making friends and enemies along the way. Our game was a bit slow starting, but we still accomplished one job, and set ourselves up to start a small enterprise of our own. Player investment in playtests is sometimes hard to come by. Nobody is really sure how developed the game is, and if the game designer or GM is unknown to them, they may not participate fully. What I saw at GPNW was five players all giving it their all to engage with the setting and the mechanics. I think it is fantastic to get that quality of player in a game. As a GM Christoph is quite liberal about handing out either advantage dice (for leverage we muster in the fiction) and threat dice (to represent additional challenge). I think that’s an important skill running any game, as it gives the players a sense of consequence for their actions. Build up a lot to make a payoff -> Get an advantage. Try something really challenging -> Face greater threat. Not all rolls are made equally. The core mechanic of rolling d10 based on your skill level and d6s based on the threat (with the d10’s providing success, and the d6’s taking them away) gave room for a large flux. Like the d6-d6 mechanic of Feng Shui, this allowed the outcomes to have a predictable average, but still potentially vary widely. The dice “feel” was solid. Christoph clearly has a love of hard sci-fi and went to a lot of work to think out the ramifications of technology and society. It came through a lot in his telling of the game and in the rules themselves. The robust negotiation mechanic is novel and interesting. It reminds me of Wilderness of Mirrors, but with an in-fiction rationalization. The payers are essentially building their own adventure, but additional risks or challenges they add result in additional income. Additional perks or rewards they get take from that. In play our negotiation took a while, but I think with refinement that will be one of the definitively novel components of the game. Complex settings are always a challenge to convey and Free Spacer is certainly a victim of this. Christoph blamed himself for not having the pitch down, but even when he’s got it refined (which I think he’s doing), it’s still a lot of setting to deliver in one go. My suggestion is to limit each pre-game pitch to conveying three major elements that are easy for people to grasp. Example: 1. We’ve got FTL travel, but only orbital communication. 2. Free Spacers pull jobs for various competing factions and organizations, often of dubious ethical nature. 3. The relevant sophont (species) in this adventure are the Atoli, traditionally matriarchal, and the armadillo species (name is slipping my mind right now), who previously were in control of this mining area, but have recently been deposed by two Atoli who call themselves “The Princes”. Related, I think focus is better than options when selling your game. Typically when I hear “this system can do anything” I turn away. I know, I know, the irony of working for Evil Hat who’s best selling game is Fate Core is not missed on me. Just the same, I’d like to see more focus as I feel like Free Spacer is currently trying to cover all walks of the Sci Fi genre. I’d like to see a solid setting pitch like: “In the wake of the Exploration Wars, the CMA has taken control of the Orion quadrant, but it’s grip is tenuous at best. You’ve, the Free Spacers have, have been hired to tackle the jobs the CMA can’t on it’s own, often resolving disputes with local provinces that remember a time when then bent knee to no one.” That’s probably not the right pitch, but the point is to focus quickly on the role of the PCs and the actions they will be taking in the game, as well as paint a broad stroke over the threats that loom. Mechanically there are some oddities that I might not have understood correctly, but seemed like they needed some revision or clearer presentation. For example some skills are your specialty skill (marked with an *), on those you get an advantage die. I couldn’t tell any distinction between an advantage die and an normal die, so the ratings of 3* and 4. They both meant you rolled four dice. Similarly their was a trouble skill that you got one less die on. I couldn’t see any reason not to just lower the rating by one. The method of building dice pools, as displayed on the sheet, felt arbitrary. For some rolls you just just rolled your skill, for others you added in dice from traits, social connections, or technology. In some cases points from technology had to first be spent for certain effects, and then any left over could be used for dice. This all feels like it can be worked out with a combination of streamlining and presentation. I wish Christoph the best in continuing to develop this game. It’s very clear a lot of love has gone into it. Seeing this post on your blog blew my mind! I feel like the guy who just saw himself on TV and has to call all his friends. 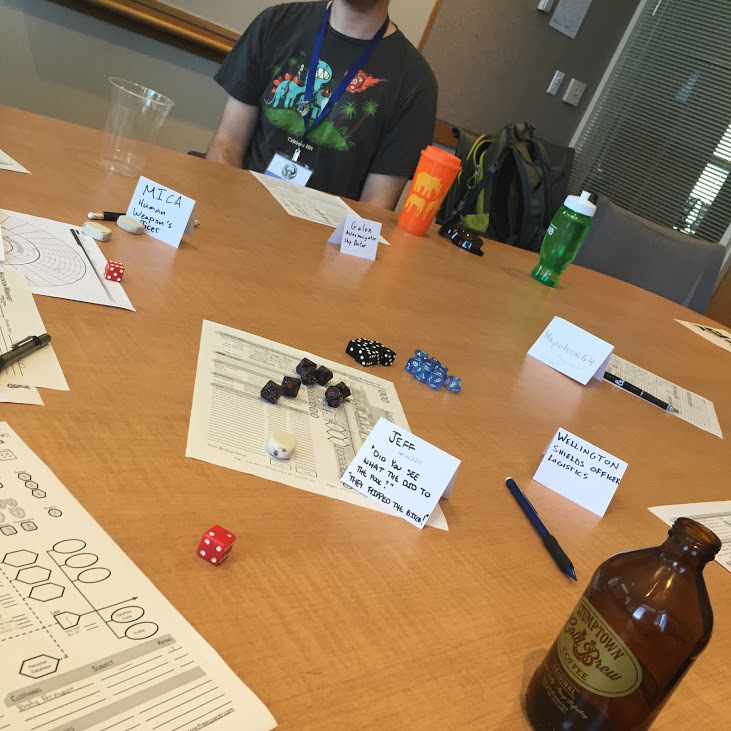 I ran two great playtests at GPNW 2015 and the feedback was indispensable! I am currently working on the next Beta. My focus is on, as you said, streamlining and presentation. I can’t wait to show you the results, the game is getting so close.